Germany - IOM Director General William Lacy Swing yesterday (7/9) officially opened IOM’s new Global Migration Data Analysis Centre (GMDAC) in Berlin. The creation of the new center is part of IOM’s response to growing calls for better data on global migration trends. The center also aims to ensure that migration data are shared and communicated more effectively. In recent years, as migration has risen to the top of the global policy agenda, demands for reliable data have increased. Yet timely data on migration are often scarce, making it difficult for decision-makers to develop effective migration policies. Even when migration statistics do exist, policy-makers may not make full use of them, because they tend to be scattered between different stakeholders and between different countries. Sharing data effectively is often just as important as collecting data. The need for better migration data is now more pressing than ever. Human mobility is on the rise, particularly across developing countries, due to a variety of reasons including environmental change and search for job opportunities. Migration now affects most countries around the world and governments are increasingly realizing the importance of reliable migration statistics to address the challenges and increase the benefits of human mobility for development. The historic inclusion of migration in the UN post-2015 Development Agenda means that countries will be asked to collect more and better data to monitor progress on how migration policies affect their development prospects, and to ensure that “nobody is left behind”, including migrants. Due to a lack of capacities, in some countries, migrants are not fully counted and important aspects of their lives are not fully recorded. Without reliable and timely information on how many people enter or will enter a country in a given period, who these people are, why they are coming and what skills they bring with them, policymakers cannot allocate the appropriate resources and design the policies needed to address the challenges or harness the benefits of migration. Without statistics on the number of nationals abroad, where they are and what skills they have, countries cannot tap into the potential of their diasporas for national development. 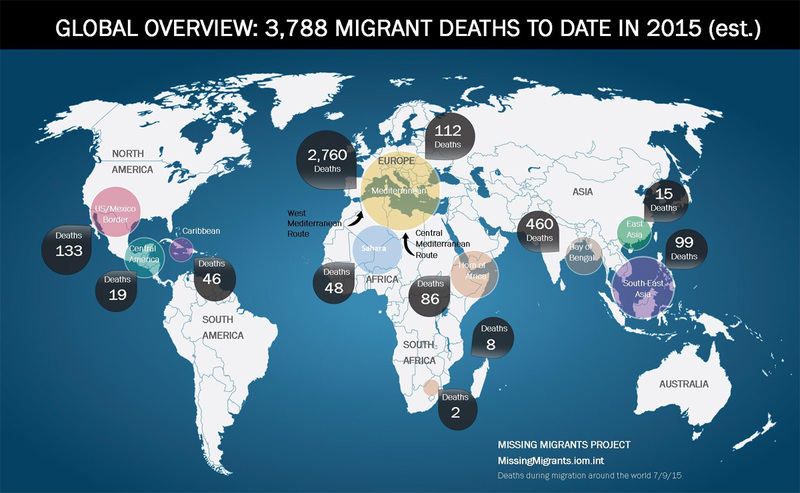 Without consistent and comparable statistics over a longer period of time, it is impossible to analyze trends, and forecast migration patterns to devise strategies to manage migration in a more humane and safe way. Improving data collection and analysis is also essential to dispel the all too common myths and misperceptions surrounding migration. People tend to overestimate levels of immigration into their countries, often believing that migrants and refugees are a burden on rather than contributors to their economies. Such misperceptions feed xenophobic sentiment while hindering migrants’ and refugees’ integration and opportunities to contribute to the recipient societies. Accurate data and valid empirical research is needed to promote a balanced debate on migration issues. “GMDAC aims to provide authoritative analysis of data on global migration issues, while advocating for the better collection and use of migration data,” said GMDAC Head Dr. Frank Laczko. The centre also aims to explore innovative areas of work in this field, such as understanding how new technologies and “big data” can be used to analyze migration trends and patterns. “These new forms of data hold the potential to provide us with new insights into patterns of migration, complementing traditional sources of migration data such as censuses and surveys,” he added. Director General Swing expressed his gratitude to the German Government for hosting the GMDAC in Berlin and welcomed Chancellor Merkel’s leadership in responding to the rising migration and refugee influx in Europe, together with her firm stance against racism and xenophobia. Germany is the third largest migrant-hosting country in the world and expects to receive up to 800,000 asylum applications in 2015 – more than any other EU country. “Locating our new global data centre in Germany makes eminent sense given Germany´s leading role in the international migration arena,” said Swing. The Global Migration Data Analysis Centre is part of IOM’s Department of International Cooperation and Partnerships at IOM Headquarters and is based in Germany at the office of IOM Berlin.